About 100 Veterans Affairs Department nurses from across the country rallied outside the department’s Washington, D.C., headquarters on Friday to protest the leadership of Secretary Robert Wilkie, the department's 49,000 vacancies and the Trump administration's crackdown on their union, National Nurses United. While administration officials have said they have no interest in privatizing the Veterans Affairs Department, many of its health care employees don't believe those claims, and fear the department is under attack and facing an existential threat. The nurses protesting in Washington insisted the Trump administration and Wilkie are being dishonest when they call privatization a “myth,” citing the longstanding vacancies and ongoing reform efforts. Several nurses who spoke to Government Executive pointed to the implementation of the Mission Act, which Trump signed into law last year, as evidence VA is committed to shifting funds from its own hospital network to private sector care for veterans. “He’s lying!” Irma Westmoreland, a nurse based at the Charlie Norwood VA Medical Center in Augusta, Ga., who took leave to attend the rally, said of Wilkie. “I take him by his actions...He’s not authorizing hiring.” Westmoreland referred to Wilkie’s recent testimony to Congress in which he said VA would hire more medical care providers in certain prioritized fields, but it would be unrealistic to backfill every authorized position. 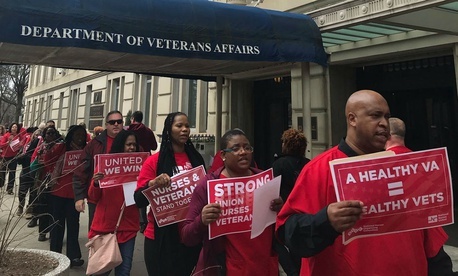 The nurses, wearing red shirts, formed a picket line outside the headquarters’ main entrance and chanted about fighting back and helping veterans. Employees leaving the building for lunch or returning to the office looked confused and surprised as they navigated around the protestors. Security guards stepped outside to monitor the event. Several nurses highlighted the divergent standards applied to VA nurses and those in the private sector. Under the Mission Act, the department will only pay for veterans to receive private care at pre-approved facilities, but the nurses said that still could lead to inadequate care for the veterans. Trump’s fiscal 2020 budget proposal called for a $6.5 billion funding increase and would allocate $8 billion directly to Mission Act implementation. Wilkie recently predicted that some opponents of the department’s approach would “claim falsely and predictably that [the moves] represent a first step toward privatizing” VA. He boasted the implementation would “revolutionize VA health care as we know it,” but maintained that expanding choice for veterans would not hamper services within the government-run network. Erin McLeod, a nurse from San Diego who came to Washington to support her union, said the Mission Act itself was privatization. McLeod and others hoped their protest would increase pressure on the administration to adequately fund and staff the department, and focus management on the needs and recommendations of rank-and-file workers. Further adding to the tension between the administration and the workforce is the impasse between the department and the 11,000 nurses represented by NNU. Wilkie last year disapproved of a contract proposed by an arbitrator designated by the Federal Service Impasses Panel after VA and the union negotiated for more than two years. Wilkie took issue with more than 350 provisions of the proposed contract, citing sections of VA statute that prohibit the department from negotiating over clinical competence, compensation or direct patient care issues. The nurses have challenged Wilkie’s decision in district court suit, while also seeking remediation on some provisions of the contract through the Federal Labor Relations Authority. The union said Wilkie overstepped his statutory authority by deeming the provisions of the contract illegal. Jack Tennant, a nurse who cares for veterans at a facility outside of Washington, saw the labor-management disagreement and the increased access to private care as a two-pronged approach from the administration. The nurses planned to go to Capitol Hill later on Friday to push for expanded bargaining rights for VA medical professionals, protections from violence against VA workers and other legislative proposals.